General Hospital (GH) spoilers tease that things are about to get even crazier for Carly (Laura Wright). She’s been paying the price for her little wedding adventure. It was bad enough that Carly escaped, but sedating Mary Pat (Patricia Bethune) really brought consequences. This nurse already hated Carly, but now she’s really on a mission for true vengeance. What’s this strange doc cooking up? It’s possible Mary Pat was talking about electroconvulsive therapy, which is perhaps more commonly known as electroshock therapy. The latter term’s a bit outdated, but it’s usually what it’s referred to in the soap world. That could certainly result in memory loss and personality changes for Carly. However, that probably wouldn’t be considered unorthodox. Electroshock therapy isn’t used as often as it was several decades ago, but it’s certainly still around. It’s mainly meant for extreme cases of mania and schizophrenia, so Carly would be suffering unnecessarily harsh treatment as usual. She’s not nuts like the rest of Ferncliff’s patients, but Mary Pat acts like she’s an insane menace to society. Electroshock therapy may not be revolutionary enough for this eccentric Dr. Lasaris. He may have a treatment that’s far more surprising. That “forever changed” comment seems crucial here. 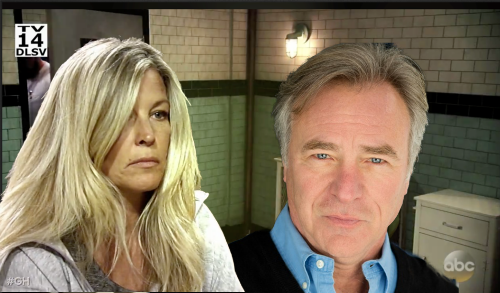 Will Dr. Lasaris try to brainwash Carly? It’s clear that Ferncliff is one shady place. Carly could easily be trained to some villain’s dirty work. Of course, we should consider General Hospital’s mystery patient and how he might fit in all this. The real Kevin (Jon Lindstrom) may be on the other side of Carly’s old room. If Ryan (Jon Lindstrom) was there before, Dr. Lasaris may have programmed him somehow. It wouldn’t be too hard since Ryan was already a dark GH character. Then, all Dr. Lasaris had to do was swap Ryan for Kevin. Whatever the case, Carly isn’t going to like what’s in store for her. General Hospital spoilers say some stunning moments are on the way, so stay tuned. We’ll give you updates as other GH news comes in. Stick with the ABC soap and don’t forget to check CDL often for the latest General Hospital spoilers, updates and news.